Soil Mixing provides a quick and cost effective way of creating cut off and retaining walls requiring less equipment on site and, importantly, causing minimum disruption to neighbours. The Soil Mixing Wall System blends self-hardening cement slurry with on-site soil to create strong reinforced walls that are quick to construct and are highly cost effective. Also known as Mixed In Place Piles and used extensively in the United States and Europe, ASP is pioneering this method at suitable locations across Australia. Depending on the type of soil and cement content, wall strengths range from 2MPa for cut off walls to 8-10 MPa for retaining walls. Wall thickness of 375mm and depths of up to 12 metres can be achieved. Significant Cost Savings: As minimal spoil is required to be excavated and is used as a fundamental part of the construction material, the cost savings in terms of equipment required on site and landfill haulage are quite significant. Reduced Disturbance: The Soil Mixing Wall System uses a specialist drill rig to create the walls and does not require a pile driver or pounder, thereby reducing the disturbance to neighbours and reducing the probability of cracks caused by vibration of sheet pile installation and the possibility of any ground movement on neighbouring properties. Flexibility: The Soil Mixed Wall System can be used as an alternative to block walls and sheet piled walls in certain locations. Soil mixed walls can also be shaved to meet specific architectural profile requirements. The twin mixing tools are mounted on a high revolution auger driver while the suspension (water/cement mixture) supply is attached. As the mixing tools are lowered into the ground, soil is mixed with grout under pressure which is constantly pumped to the mixing tool as it descends to the required depth. The developed mixture from soil and suspension is further mixed during tool withdrawal and suspension continues to be pumped. Once the augers are withdrawn, the completed wet mixed twin-pile is ready to cure. Single piles, secant pile walls, block patterns or any other required patterns can be produced. Call ASP Piling on 1300 949 607 or contact us now for more information on the Soil Mixing Wall System and how we can help make your construction project in New South Wales, Qld and ACT, plus other locations across Australia, a success. The information on this page is available for download as an A4 sized PDF data sheet suitable for printing. 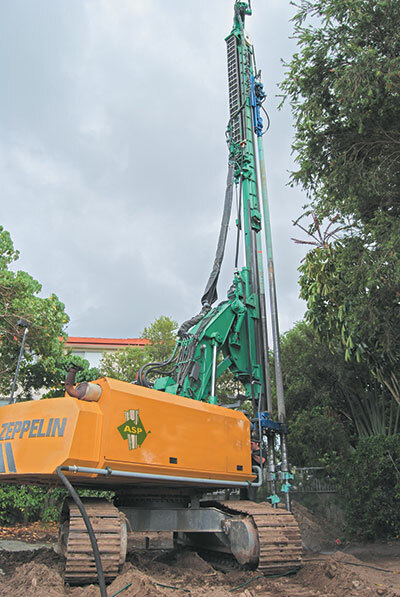 ASP Piling soil mixing rig on a Queensland residential construction site.